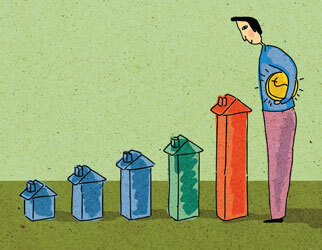 A recent report by TD Bank suggests a gradual adjustment, rather than a drop in prices, that matches, more closely, the historical appreciation of real estate. The more sober call for a “gradual adjustment” comes from a recent TD Bank report. The report, released this week, suggests that the real rate of return for housing prices, post 2015, will be about 3.5%. This shift from the average 5.4% return we’ve seen year after year for the last decade is due, in part, to a number of macroeconomic fundamentals, such as a slow rise in average incomes, a close to stagnant national economic growth rate, Canada’s aging population and immigration figures. In short: we are returning to pre-1998 housing valuations, when nominal rates of return on real estate matched inflation at around 2%. (For those that keep track, there was a surge in home prices between 1982 and 1989, and again between 1972 and 1977). For the last few years economists, financial analysts, and bloggers have warned us about the forthcoming housing crash. Don’t get me wrong, there’s still a potential fall out when this nation of debtors finally comes face to face with the impact of rising rates, but the silver lining really is that housing prices in Canada are flattening out, and returning to stable levels. While sellers may be disappointed, buyers won’t be (nor should sellers, since most of us have to buy when we sell). This is particularly true for the next couple of years, as housing prices start to gradually drop in value. As Kenneth Rosen, chairman of the Fisher Center for Real Estate and Urban Economics at the University of California-Berkeley, points out: “Prices are back to [increasing] 1% to 2% more than inflation over the next 10 years,” right in line with long-term appreciation averages. According to data compiled by Yale University professor Robert Shiller, U.S. home prices increased, on average, by 0.5% per year from 1890 to 2008. A 3.5% real rate of return over the next 10 years doesn’t look so bad.